The press below is a barn fresh 9x13 Damon & Peets Press. D & P made presses from 1887 - 1894 out of New York. Most of their presses were sold by other distributors and not by themselves. These presses were normally nameless and the distributor would put there name it before selling it...or sell it nameless. 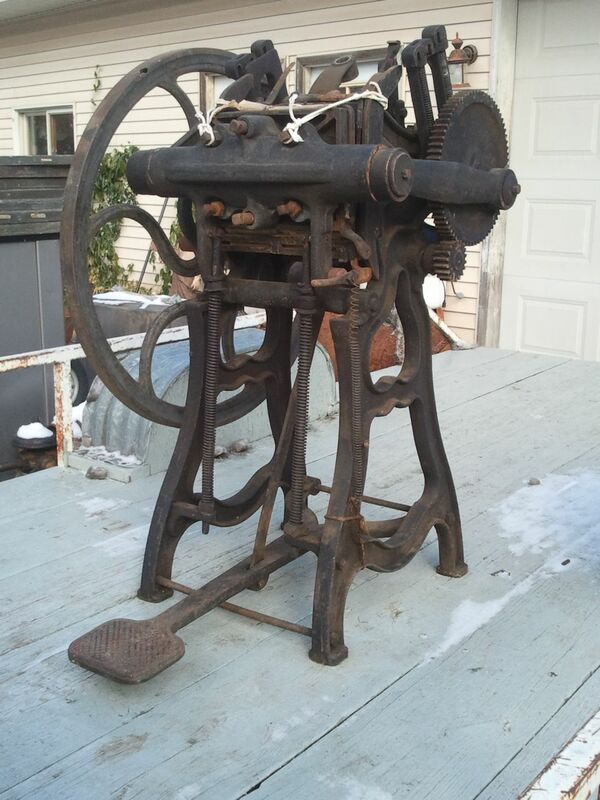 This press has been sitting for over 40 years and came out of an old building on the edge of Browntown, Wis where it had been stored for over 40 years untouched. There is no throw off and the flywheel has a large casting flaw (hole) in it....you can see it in the picture. There is an ink wheel...but always remove those when moving a press!!!! It's a three roller press, but only have one set of truck and a core!!! A feeder board and brackets were never found, but believe when it was moved into storage in Browntown the feeder board was removed so it wouldn't get broken. This press has a unique feature of two long vertical springs running from the base of the press to the bottom of the platen. As the platen opens it compresses the springs....then the compressed springs help to push the platen upward and closed for printing. This is a very smooth and balanced press....and treadles very very nice!! Can't wait to print with it!!! !